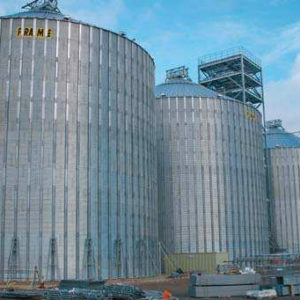 Each silo has a diameter of 24m and a height of 29m. 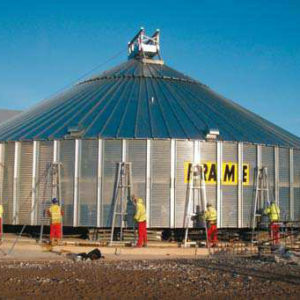 All 4 silos were erected simultaneously using manual chain jacks. 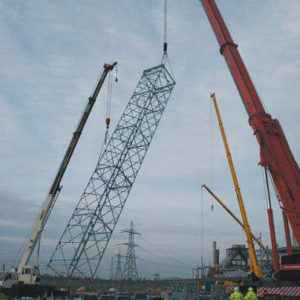 The erection was completed ahead of programme in 15 weeks and included installation of associated catwalk structures and central elevator tower. Syntex have gained a wealth of experience and expertise in the installation of product conveyance and processing equipment. This includes but is not limited to chain and screw conveyors, bucket elevators, grain cleaning, milling and mashing, by-product pelleting and drying equipment. Dust extraction and explosion suppression equipment installations are also areas that we can assist with. Work undertaken by Syntex includes fabrication and installation of carbon steel and stainless steel non-pressurised and pressurised pipelines, in-line instrumentation, valves and bulk storage vessels. The majority of this work has and is performed by directly employed tradesmen. We can carry out welding to both ASME and BS EN standards and satisfy the requirements of the Pressure Equipment Directive.